The Japanese Pattern Challenge: Victorian Shirt - Round 2. 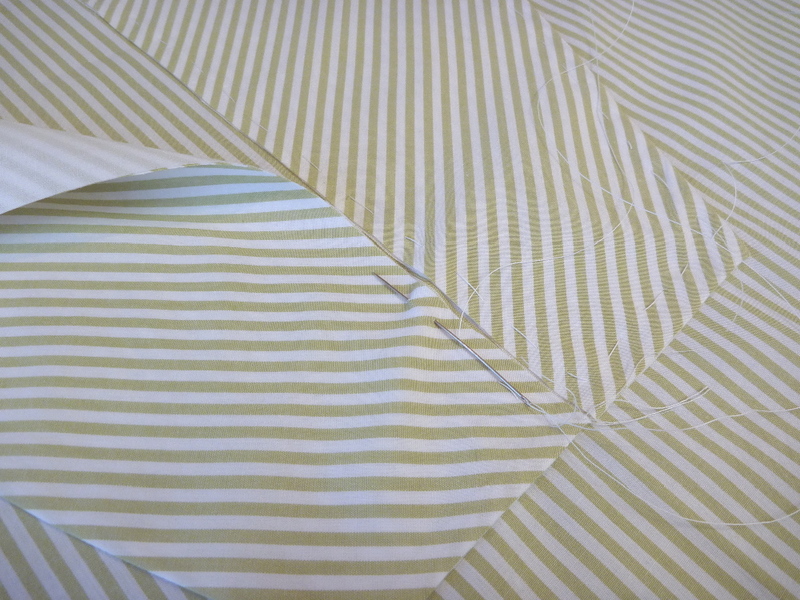 Simplifying the placket? Victorian Shirt - Round 2. Simplifying the placket? I'm really pleased with how the purple Victorian shirt turned out. There are still some things, however, that could use some tweaking. I think while the construction is fresh in my mind, this is the time to make another. So here goes. My major goal with this version is to simplify the front bib and placket construction. 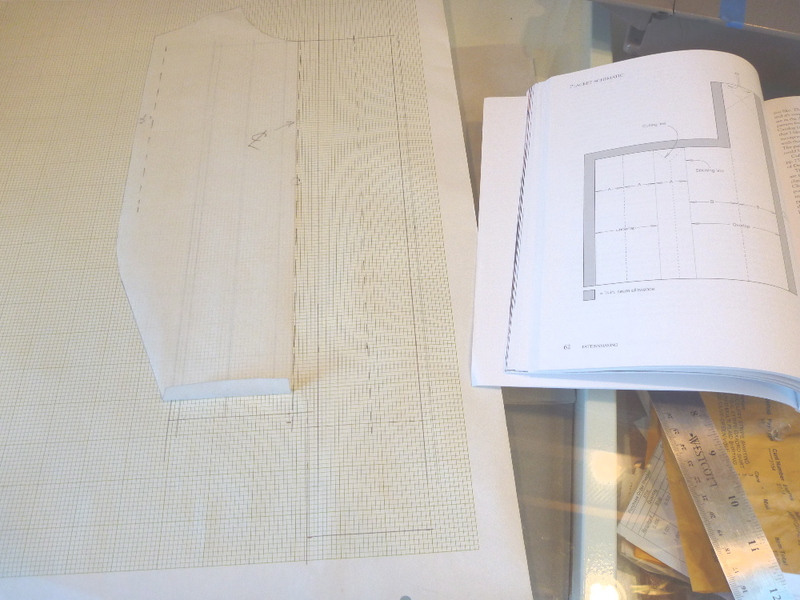 Using David Coffin's shirtmaking book, I'll enlarge his pattern for a sleeve placket and through some sewing origami turn it into a center front placket. Easy, right? Oy, what a mindbending exercise. I laid the bib pattern piece on some graph paper, established a center line and sort of worked my way out from there. I think I had to go back and revise it twice. Victorian shirt #3 (if there ever is one) should be much easier as a result of this exercise. My fabric is a very finely woven cotton from Italy. 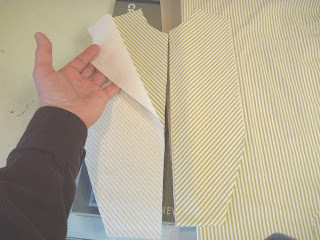 I cut the bib sections on the bias and I'm concerned that the vertical stripes of the shirt front will show through when the bib is layered over the front. Then I'll have all kinds of crisscrossing stripes. To minimize the transparency I've lined the bib sections with some very lightweight batiste. 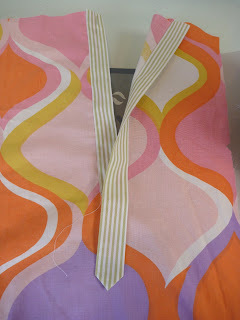 I attached the batiste with a 1/2" seam, turned and pressed the bibs. Problem solved. To play it safe I experimented with a fabric that had a clear right and wrong side. 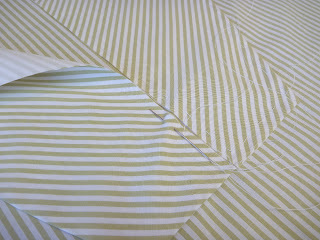 Success, I have a placket that folds left over right. Here is the completed bib and placket. 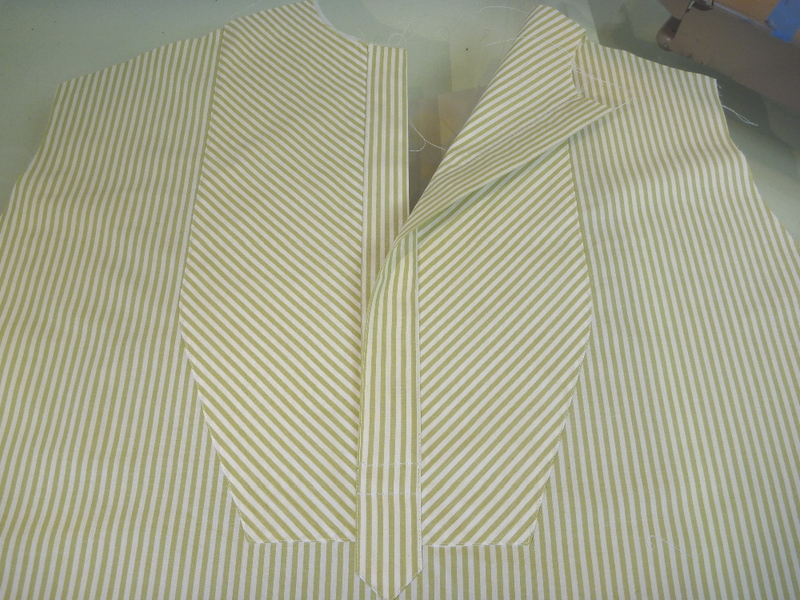 Unfortunately the stripes of the placket didn't exactly line up with the stripes of the shirt. I'm off by about 1/8". Shucks. On the plus side, this construction has eliminated the unflattering center box pleat that the original pattern has. I think that trade-off is worth it. This, I believe, wraps up the most difficult part of this shirt. The rest should go together easily. Fingers crossed! That orangey-pinkish fabric definitely has a right side! Cool! And very well done. I must add that the mind bending exercise you went through to convert my sleeve-placket diagram to a CF placket had been done already just a few pages further on in my book (page 74), where there's a larger pattern for just this purpose. No doubt you learned more from your exercise than from using my pattern, but you might want to check it out for your next Victorian:) Great stuff here, so glad I stumbled onto your blog!